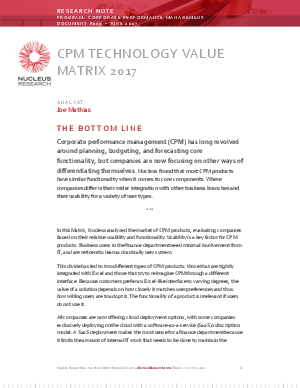 The Nucleus 2017 CPM Value Matrix analyzed the market for CPM products, evaluated companies and ranked vendors based on what they believe are the most important attributes in allowing customers to gain maximum value from the solution: usability and functionality. Usability because Business users in the finance department need minimal involvement from IT, and are reticent to learn a drastically new system. Download the 2017 Nucleus Research to learn more.